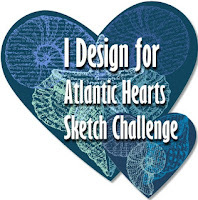 Our Facebook group creative challenge this week is a sketch...and you know how I love my sketches!!! I pulled out one of my favorite sets, Tropical Chic, along with the coordinating paper and got to work. I wanted to keep it in the green family but decided a little pop of black really helped!! The designer series paper I used, Tropical Escape, is part of the Buy 3 Get 1 Free sale going on this month. Better hurry though, you only have a couple more days left to take advantage of it!!! I'd better go order myself more!! !